´Entrepreneur´ is a loanword from the French language that refers to a person who undertakes and operates a new venture, and assumes some accountability for the inherent risks. Most commonly, the term entrepreneur applies to someone who establishes a new entity to offer a new or existing product or service into a new or existing market, whether for a profit or not-for-profit outcome. Business entrepreneurs often have strong beliefs about a market opportunity and are willing to accept a high level of personal, professional or financial risk to pursue that opportunity. As a Resource: Entrepreneurs are people who organize other productive resources to make goods and services. The economists regard entrepreneurs as a specialist form of labor input. The success and/or failure of a business often depends on the quality of entrepreneurship. "Say what you do, Do what you say, Be able to prove it"
This is a philosophy that many agree with but is difficult to implement without commitment throughout the organization. Like anything, it can be over done. What most of us do in our jobs is detailed and fluid. Limiting our actions to a predefined set of approved processes is often non-productive. On the other hand, an organization run efficiently on "group knowledge" may work on a small scale. As more staff is added a more formal process documentation system is required if only for training purposes and to more clearly define roles and responsibilities. This is often the hardest move for the entrepreneur. We built our businesses by relying on a few key people to intuitively know what needed to be done and when and how to do it. Many of us worked extreme hours because we felt we had to do it all ourselves if it was to be done right. Every entrepreneur reaches a point where we must "grow out of our own skin" - to move from "doing it all" to delegation of the more tactical aspects of the business. This frees time to focus on the strategic and critical. The Quality Mantra has been used successfully to allow staff to take responsibility - to own the processes they use to get the job done. These are not dictates from on-high but tools to help groups of individuals doing similar tasks develop best practices. 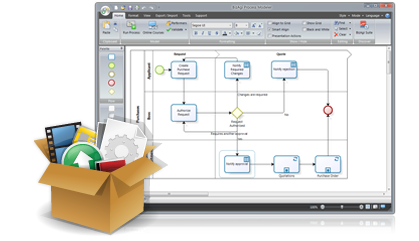 There is now a standard Business Process Modeling Notation that is gaining acceptance. This is due in part to an excellent FREE tool called BizAgi (stands for Business Agility). The has a very good look and feel modeled after Microsoft Office 2007. "Search Engine Marketing, or SEM, is the art and science of increasing qualified leads to a Web site from search engines and other Internet sources." Search Engine Optimization is making your website Search Engine Friendly. A quote from the same White Paper, "To ensure that when search engines list the customer’s Web site, the site has been optimized to convince the search engine’s algorithm that the Web site should receive the most visibility in the search result." This excellent paper descibes the concept in detail. I encourage you to click on the link above to download and read it even if you are not a lawyer.